A thermostat is the device that allows you set the desired room temperature that you want your home heating or air conditioning system to run at. A Programmable Thermostat is a type of thermostat that allows you to select what temperature settings that you want for certain times of the day, and for some models, what days of the week. So for example, in the wintertime you can program your Programmable Thermostat to automatically lower the temperature when you leave your home, and then automatically start to warm it back up just before you get home. 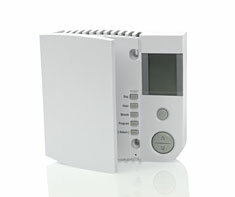 And similarly, in the summertime it can automatically control temperature changes for your air conditioning system. By automatically turning down heating and air conditioning at night, you can potentially save up to 20-30% on your heating and cooling bills. Central Air Conditioning and Furnace (gas). Shown in the 'Routine Care' section are the recommended routine maintenance tasks for your programmable thermostat. The 'Q & A' section shows answers to common questions. And the 'Articles' section provides helpful articles about your programmable thermostat.